Tech Resources TMC offers the best quality available! Why Use an Active Optical Cable? Active optical cable (AOC) is a high-performance communication cable used for short-range multi-lane communication and interconnected applications. What is an Active Optical Cable (AOC)? An Active Optical Cable transforms the data signal into a laser light, which is communicated over an optical fiber. The conversion of electronic data is done by an optical transceiver connector. This allows for the fiber to disconnect from the transceiver. At the transceiver’s end, Active Optical Cables bond the fiber connection, which in turn creates a cable assembly similar to a DAC cable. Active optical cable have four functional parts. 1. 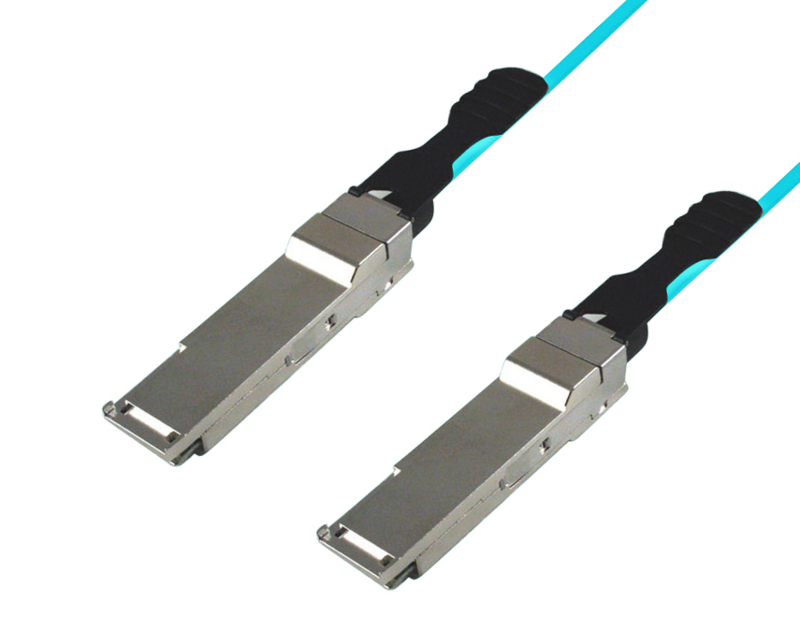 High-density QSFP+ connector allows for the cable to be plugged into a router or switch. 2. 4- Channel full duplex active optical cable transceiver is embedded inside the shell and is responsible for electrical- optical conversions, making AOCs a lower cost solution in comparison to other transceivers. 3. MPO optical connector is a permanent attachment to the shell and fiber, protecting the interface from the end users (consumers) and environmental contamination. Active optical cable assemblies offer several potential advantages. In comparison to heavy copper cables, AOCs are lighter in weight and thinner. Therefore, they do not suffer from the length restrictions of copper cables. AOCs have longer reaching potential. Additionally, to address bandwidth issues, copper cables become bulkier and harder to manage and these cables risk more power delivery issues. Therefore, the bulkiness and weight of copper cables make a terribly inelegant system communication solution. Copper cables may be a somewhat feasible solution for small data center clusters. However, for large clusters, the link distance and the actual layout of the cluster makes it physically challenging to manage and operate. Overall, copper cables make for a messy and complicated data center design solution. In addition, due to the nature of electrical signals, electromagnetic interference (EMI) limits both the performance and overall reliability of copper. Active Optical Cables were initially invented to replace this limited copper technology across data centers. AOCs are far superior in performance and their advantages are undeniable. Some super computers have completely shifted from using coper cables to AOCs. The electrical to optical conversion improves the speed and increases the distance performance of its predecessors, while still remaining compatible with standard electronic devices. AOCs must adhere to the IEEE, IBTA and SFF standards. Since the optics are contained inside the cable, AOCs have freedom from industry standards for electrical, mechanical and thermal requirements, eliminating costly optical testing. In addition, the optics location gives AOC designers freedom to find consumers low cost materials and transceiver designs. Compared to copper cables, this makes AOCs a much more cost effective solution. In fact, a TMC active optical cable is currently one of the lowest priced optical interconnect available. Generally, they are about half the price of costly optical transceivers. Furthermore, if the network equipment utilized is properly designed, reconfiguration of AOCs are quite simple and easy. Also, AOCs are lightweight in comparison to its predecessors, making data centers physically easier to manage. The International Organization for Standardization (ISO) certification is valuable not only to a company’s customer, but it is also a valuable internal assessment process that allows a company to examine its business practices. Being an ISO certified company is the result of an improvement in every function of the company resulting in benefits for its customers. To obtain ISO certification a company must demonstrate that it can adhere to ISO voluntary standards. The company must operate efficiently and safely to deliver the highest quality products and services that will meet or exceed customer expectations. 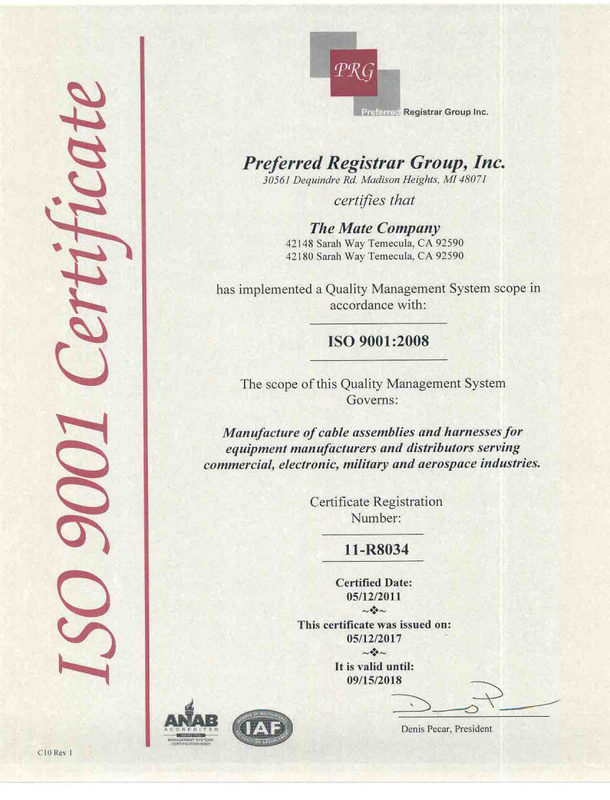 TMC – The Mate Company has achieved ISO 9001:2008 certification for six straight years. During this time, we have made continuous improvements in our processes that benefit both our customers and us. Meeting the ISO 9001:2008 standards has required that we evaluate all of our processes using detailed metrics. This evaluation has ensured that our quality control and our business practices are managed to meet the highest quality possible. ISO certification requires that we use business metrics to ensure that we meet these objectives. These metrics are tied to our quality objectives and our organizational strategy as well as our vision and mission statements. Customer requirements and expectations are met or exceeded. Customer satisfaction is measured on a defined consistent schedule. Understand and support supply chain management criteria. ISO certification means that our manufacturing processes have eliminated product discrepancy and that we have achieved our on-time delivery goal. Quality does not just happen. It must be created. ISO 9001:2008 specifies operational processes that are required for producing high quality products. These processes are the result of organizational strategies that enable us to achieve the highest level of quality. Our ISO 9001:2008 certification means that we have demonstrated our ability to create and follow quality management procedures. Our process ensures that our products adhere to strict requirements. We also have processes that ensure continuous improvement of every function of our company. Being compliant with ISO 9001:2008 results in every process and every function being dedicated to achieving the highest level of quality for our customers. Every employee has an important role in making sure that all operations run efficiently with the goal of bringing our customers the best and most affordable products and service. We are constantly reviewing our processes and working for continuous improvements in every aspect of our business. This is what being an ISO certified company drives us to do. The end result is a better product at the best price possible with minimal product return. Our quality assurance gives our customers a strong peace of mind. If a company has the opportunity to buy from an ISO Certified company, why would they look anywhere else for the same product? Buying from a quality company will mean more success and fewer problems. A company that buys from us will realize a stronger bottom line and more satisfied customers. TMC – The Mate Company will deliver on all of its ISO 9001:2008 commitments. Welcome to the new TMC Cables Tech Resources page! TMC – The Mate Company is very excited to start writing about industry related topics and ideas. Our aim is to focus on providing customers with important information regarding topics such as: cables, data storage, industry news, etc. We hope to help educate potential customers regarding topics that might not be spoken of too often. Think of us as your new “go to” for all things cable related! Remember to check the TMC Cables Tech Resources section to catch up on industry trends, trade events and any sales we might be offering. If you wish to reach out to us, you may do so several different ways. By phone: 888-999-9984, by email: sales@tmcscsi.com or by fax: 415-454-5130.